Clinic | Macon County Health Dept. 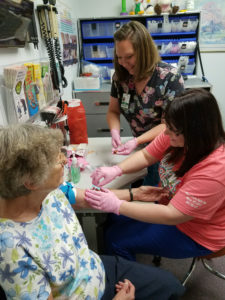 From flu shots and pregnancy tests to lab testing and TB screening, Macon County Health Department offers clinical services for the community through our Clinic. You can call ahead to make an appointment or just come in. 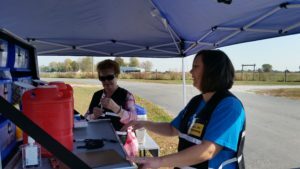 The Macon County Health Department offers an annual Drive-through Flu Shot Clinic. During the event, you can conveniently stay in your car while you receive your flu shot by a trained health care professional. This event is typically held in September or October, but flu shot vaccinations are provided regularly at the health department on Clinics days. See our Calendar of Upcoming Events..
To learn more about the services provided at the Macon County Health Department Clinic or to schedule an appointment, please call 660-395-4711. Vaccinations have been one of the top ten achievements of public health in the United States. The Macon County Health Department wishes to remind the public of the importance of vaccinating children as well as adults. Vaccines are required for school, college, and some work place environments.The Macon County Health Department now accepts insurance for immunizations. We offer the Vaccines For Children program for qualifying children. Call 660-395-4711 for more information. For details/cost please contact the health department at 660-395-4711. *We recommend that you bring in your immunization record with you. We offer Urine Drug Screening. An order from a medical provider or request from a school/employer is required prior to performing the test. Note that this is a screening only and not a certified test. The client will be required to sign a consent form and a release of records for the results to be sent to the requestor. There is a cost for the Urine Drug Screen. Please call 660-395-4711 for more information.